Andrea Ballatore and Werner Kuhn. Thinking about Spatial Computing. Presentation slides (pdf) and the North Korea example (pdf). Marinos Kavouras, Margarita Kokla and Eleni Tomai. Crowdsourcing Spatial Thinking Resources across Disciplines and Educational Contexts. Presentation slides (pdf). 1) Assist educators in developing interdisciplinary courses on spatial thinking. 2) Develop a repository of educational materials that educators could use to create interdisciplinary courses on spatial thinking. Spatial thinking spans numerous disciplines and perspectives, so there is a need for courses to address spatial thinking from multiple perspectives. However, developing course material outside of one’s discipline can be particularly challenging, and these challenges can restrict the perspectives taught within a single course. 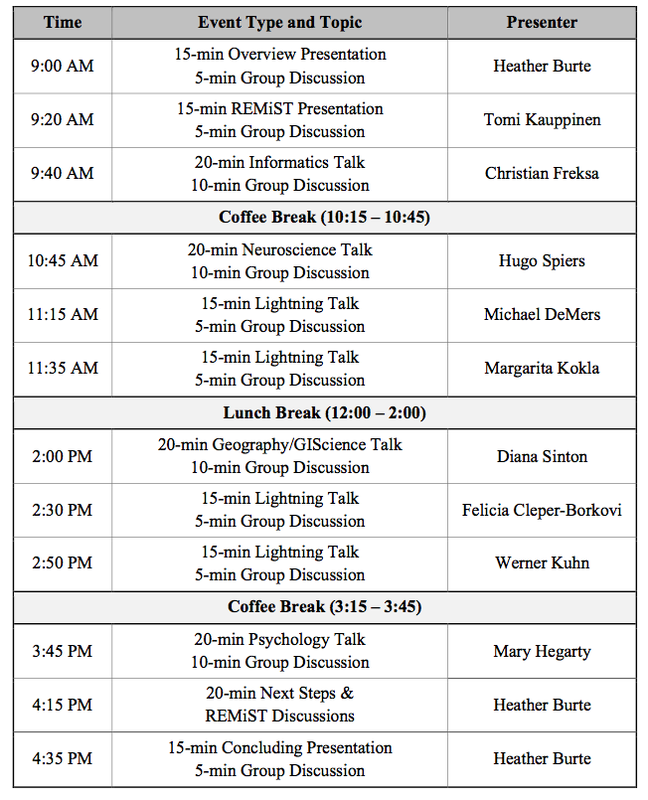 Lightning Talks: Workshop participants will provide their perspectives on teaching spatial thinking from their discipline’s perspective in 5-minute lightning talks. See call details below. Group Discussions: Breakout and large group discussions will foster discussions between individuals with differing perspectives on spatial thinking. These discussions allow workshop attendees to learn more about discipline(s) that they are unfamiliar with and to share educational resources. Online Resource Repository: Throughout the workshop, educational resources will be collected and developed into a repository of interdisciplinary educational materials. After the workshop, this repository will be made freely available online for educators to use in developing their own interdisciplinary spatial thinking courses. Who should participate in the workshop? SPATIALTHINKING2015 is relevant for 1) junior faculty or individuals, such as post-docs and graduate students, who might teach a course in spatial thinking in the near future and also for 2) for experienced faculty, who might already teach a course in spatial thinking, but who are interested in expanding the perspectives from which they teach their spatial thinking course(s). Call: If you want to share your perspective on spatial thinking, by giving a lightning talk at this workshop, please submit a short paper (using EasyChair). Short papers should be a maximum of 4 pages in length and follow the Springer LNCS formatting style. Guidelines (including Word and Latex templates) for authors can be found at http://www.springer.com/computer/lncs?SGWID=0-164-7-72376-0 and submissions should be made to https://www.easychair.org/conferences/?conf=tstip2015. Note that papers not adhering to the style guidelines or the page limits will be rejected without review. Manuscripts will be reviewed by at least two members of the program committee. At least one author of each accepted paper must be present at the workshop to give the lightning talk. We plan to make the workshop proceedings available on our Educational Resource Repository, and publish the workshop proceedings with CEUR-WS. Topics of Interest: Short papers, and their accompanying lightning talks, must focus on some aspect of teaching spatial thinking and provide resources for teaching an interdisciplinary spatial thinking course. Examples of topics include: educational resources/tools/recommendations, major spatial thinking topics, major spatial thinking findings, recommended readings, and/or future directions. The author(s) field(s) may include any discipline that deals with spatial thinking. Disciplines include, but are not limited to: Psychology, Geography, GIScience, Geoscience, Education, Informatics, Linguistics, Neuroscience, Architecture, and Art.